One month ago I graduated college (again). One month ago I decided that I would not apply for traditional jobs, with salaries and schedules, benefits and retirement plans, bosses and offices. One month ago, I decided to work for myself, choose my own projects, and write my way to a living. Here's how the first month went. 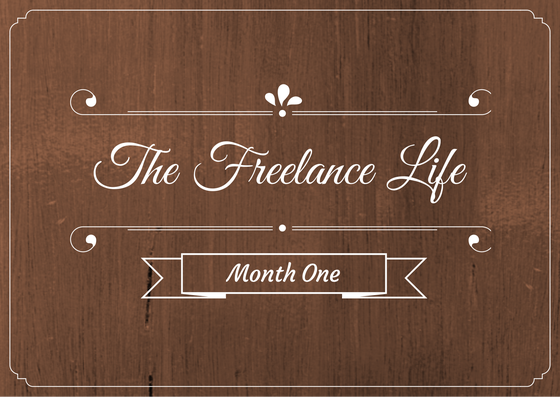 I actually started freelancing at the beginning of 2014, while I was still in school. One day, while thinking obsessing over post-graduation plans, I emailed an acquaintance out of the blue to ask about tutoring jobs. She put me in touch with a woman who did marketing for local businesses, we hit it off, and I started writing one or two articles a week for her. Eventually I started working in her office for an afternoon here and there, helping with administrative stuff and taking on more and more writing assignments. I really like working with her, and she's been a great business and marketing mentor. While I enjoyed the marketing work I was doing, I knew I needed more than just one gig. Not only because I needed more money, but because I wanted more security - if one job dried up, I needed others to fall back on. Plus freelance work ebbs and flows. Not everyone is busy all the time, but the bills are not so forgiving. Just as I was starting to look for more work (I was still in school & teaching at this point, so I wasn't in a huge rush) an opportunity came through the MFA listserv. A local start up was looking for writers for its "integrated content marketing strategy" which, I quickly figured out, was a fancy word for blog. I applied, interviewed twice, and got the job. I wish I could share a link, as I've been writing a ton for this blog (all of it about alcohol, which I'm enjoying, for obvious reasons), but it's not live yet. Neither is the app the company is working on - both should launch sometime in mid-July. You can get a preview here, but basically it's an amazing and awesome app that will change the way wine and beer is experienced. I've seen a demo, and I can't wait for it to take the world by storm. I'll write more about this later, but suffice to say I'm super excited and grateful to watch this idea become reality from the inside. Most of my emails went unanswered, but then I got a response from an editor, asking me to write a sample blog post for a new online women's magazine. I did, she liked my work, and now I'm a contributing writer for Moxie Lady. It's a newer site but I really like the focus and the range of articles it publishes. My first post was about my attempt to craft a minimalist closet, which was a ton of fun to write. I have a few more articles to send them this month, one of which I hope to finish today. While this won't become a freelance-focused blog, I will post monthly updates about how things are going. If there's anything you want to know more about, let me know! And if you have any advice to share, please do. I'm brand new at this and learning as I go, and I'm open to pretty much anything.